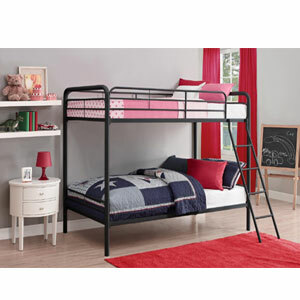 Twin Over Twin Bunk Bed - Black, White or Silver Metal Frame perfect for small rooms, kids rooms or vacation home furniture. Simple, sleek, secure, stable and space-saving, DHP Twin-Over-Twin Metal Bunk Bed meets all your needs and expectations. Easy to assemble, the bunk bed has been designed for the utmost safety, providing full-length guardrails and a ladder that attaches to the frame. Accommodating two twin mattresses, the black metal frame will last through years of rough play, whether hosting twins, friends, family or siblings. Add A Bunkie Board To Increase The Weight Capacity Of This Bed.